You probably have wished getting started with 3D printer, as I did, but you may have been put off with the high cost associated with 3D printers even the cheaper ones for several hundred dollars, especially if you are unsure whether you’re going to use it often. But there’s now a very affordable 3D printer kit based on Prusa i3 printer that sells on GearBest for $146.99 including shipping with A8PRINT coupon. Supported materials – ABS, PLA, TPU, Luminescent, Nylon PVA, PP, Wood??? The manufacturer recommends Cura or Repetier-Host software for Windows, Linux, or Mac OS to work with the printer. It’s a kit, so you’d need to assemble it, and it should take around a day, although Tulio Laanen, who is experienced with 3D printers and has reviewed Anet A8 in the video below, managed to do it in 4 to 5 hours. Overall he was surprised by how well the printer worked considering the price, but he also printed some parts to improve the printer, and the provided filament roll. You’ll also find 3D files for Anet A8 spare part on thingiverse. I have a bunch a development boards without case, so such printer might be an interesting addition, especially it’s likely to become popular as for less than $200 shipped, it’s cheap and appears to work reasonably well. This does look like a decent deal for this type of printer, however it might be beneficial to wait for cyber monday deals, etc. Hobbyking recently had the Malyan 150 which is comparable in design to this printer, but nearly fully assembled (only need to add 4 bolts) and with a metal frame for $217 shipped to the US. I don’t really recommend a first-time hobbyist assemble their own printer, as there are many challenges and pitfalls. Cases are exactly what I had in mind :3 I’ve been gutting dead PSUs picked off a local repair shop that fit the boards + their power adapter with a hard switch + fan so far. 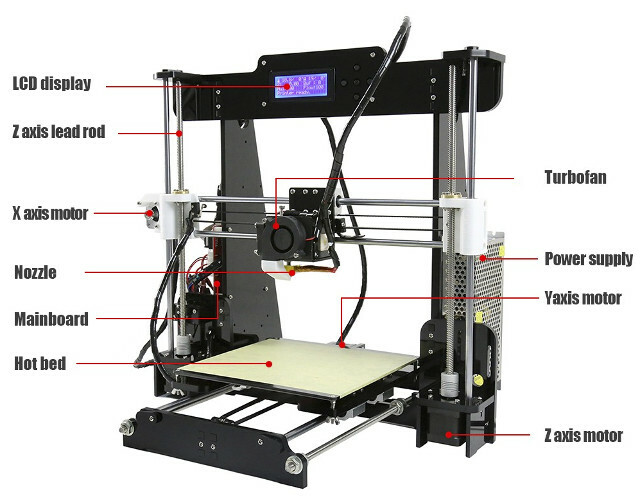 Hi I live in Brazil and I’m interested in this 3d printer Anet A8. I’d like to ask about the supported materials. ABS, PLA, TPU, Luminescent, Nylon PVA, PP, Wood? Is it possible to work with something similar to wood? And about the archives format…it doesn’t accept autocad or corel draw extensions? And if I would buy it how could we do the transport of it? Got this months ago, works very good for the price. I have just made cases and it has not dissapoint. Printing cases is one of the first things I did with my printer as well. There are a ton of case designs out there. Beware getting into 3D priting, it can be a huge time (and money) sink. I have practically the same design from ali and it works fine for the price. Rpi/opi run octoprint or repetier server quite nice, and there’s no hassle with cables. And I confirm, this is a huge time sink. 🙂 Beware of the customs clearance too, such things don’t go through unnoticed. The supported file formats are listed in the specs and do not include autocad or corel draw extensions. There may be a way to convert those, but I just don’t know. GearBest will use post or courier to send the parcel. Brazil customs are known to be a pain though, both in terms of red tape and the amount of duty they charge. So you’d better study about customs before ordering, maybe ask on 3D printing websites. I see a few issues mainly in the parallel guides. Are there many issues or tools required to get them to run without binding? There was a company named Data Products years ago that had a mechanism similar to the dual bar horizontal bus, and they about went out of business with the problems with binding and general unreliability. They ended up beefing it up and increasing cost, as well as very intricate tooling to get the printers together. Biggest thing you see aside from binding is nonlinear on not constant current / drive / speed on motions if the bars are a bit off, as though the motion may not bind, it will increase the drag on the motors as the parts fly around. Otherwise looks interesting and tempting with the wide variety of material. Any comments on acquisition of the software mentioned, file formats to directly feed the printer, is there offline capability or is that something that you could add with a Pi? The link you provided takes me to 157.99 for EU plug. Changing that to US plug, gets same price. Applying DesktopGB as the code on the cart page brings the price to $222 or so. Not sure why the discounts are doing that, similar thing happened yesterday with the Voyo2 code on Gearbest. Not a complaint, just info. I hope the link you supplied gets you credit or whatever. cheaper on aliexpress, 149euro shipping included. great tip though probably gonna buy one. Need to wait until 11.11 before ordering, otherwise it’s 188. I hope I’ll manage to get it home. Finally I won’t be able to get the 3D printer, DHL will send it back to China. I could have probably gotten it, but this would have involved buying a return plane ticket, maybe one night hotel, filling some paperwork, and if successful (not guaranteed), I would have had to pay DHL handling fee, some warehouse fees, VAT, and possibly some custom duty. Of course,there was always the possibility I was enable to provide all required documents, so I could have purchased a plane ticket and wasted my time for nothing. it is really easy to assemble something as simple as this in a few hours. Its a challenge, but “first time hobbyists” shouldn’t let that put them off. As long as you are mechanically competent and can problem solve, building this printer should not be a problem. The build instructions are poor and the print bed needs adjusting every time you print. Out of 1kg of printer filament the print nozzle only clogged up once. Also alignment shifted half way through a print. I changed the linear bearings which gave a cleaner print. Also added a print bed film which improved part adherence considerably. If you persevere with this printer it provides good results. There are two different versions of this printer that seems to ship randomly. I found the correct instructions for mine down in the comments at Gearbest. The one shipped to me did not exactly match the product listing. All of the electronics look the same, mine has mechanical differences. Anet is cheap and it´s prusa style, but would not it be better to buy the original Prussian i3 MK2? Yes, I remember last year the printer was quite popular, I think 40 to 50 people ordered through this website.